WHY RECOMMEND METAMUCIL MULTIHEALTH FIBER SUPPLEMENT? BECAUSE ALL FIBER PRODUCTS ARE NOT CREATED EQUAL. The psyllium fiber in Metamucil offers multiple health benefits. 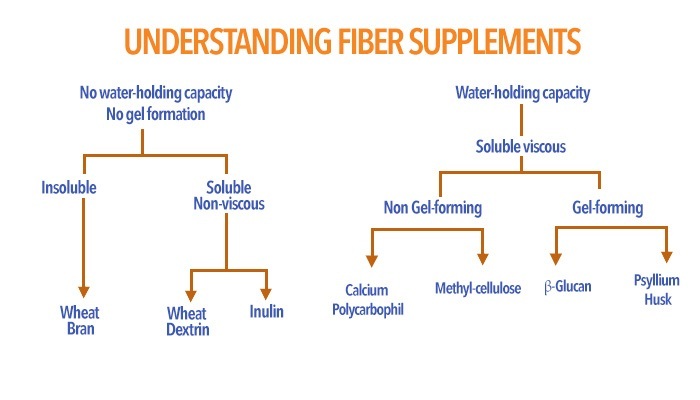 Unlike clear-mixing fiber supplements with no capacity to hold water, psyllium forms a viscous gel which drives psilluym’s multi-health benefits.The chart below shows how common sources of fiber fit based on these criteria. **Survey of 291 adults who self-reported that they felt lighter, more energetic, more active, and more comfortable after completing the Metamucil Two Week Challenge. †Diets low in saturated fat and cholesterol that include 7 grams of soluble fiber per day from psyllium husk, as in Metamucil, may reduce the risk of heart disease by lowering cholesterol. One serving of Metamucil has 2.4 grams of this soluble fiber. One serving of Metamucil capsules has at least 1.8 grams of this soluble fiber. ‡Among recommendations in a QuintilesIMS ProVoice survey 2017 (OTC therapeutic fiber category). ¥P&G calculation based in part on data reported by Nielsen through its ScanTrack Service for the Digestive Health category for the 52-week period ending 01/13/2018, for the total U.S. market, xAOC, according to the P&G custom product hierarchy. Copyright © 2018, The Nielsen Company.